My youngest son was born in December, so for his first birthday, we used a Snowman theme. Using a photo editing program on the computer, I placed his face on the body of a snowman and created invitations. There were other snowmen in the picture, and the invitation read, "Guess which snowman is turning one?" They were adorable, and a year later, friends and family still have the invitation posted on their refrigerators. My husband and I made a Snowman cake by baking cakes in round pans of different sizes, and placing them on a cake board in the form of a snowman. We iced the cake with white icing and used colored icing to draw a scarf. With a square piece of cake, we fashioned a top hat, which we frosted with chocolate icing. Candies formed his face and buttons. We gathered twigs from outside to make arms, and topped the whole thing off with edible white glitter that I found at a cake decorating shop. It looked just like snow, and the kids loved it! We decorated the house by hanging plastic snowflakes and used red, green, silver and gold balloons. The older kids made snowmen out of marshmallows and toothpicks and decorated paper frames with snowman stickers. We took pictures of each child and returned the picture and frame as a thank you card. As party favors, we gave plastic snow globes, snow stickers, and little bendable snowmen that I found at a discount party supply store. We also gave each family a snowman Christmas ornament with our family's name and the year on the back. Everyone had a great time! 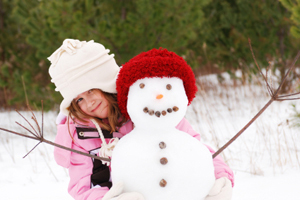 With older children you could add a snowball toss, pin the nose on the snowman, etc. It's a wonderful winter party!